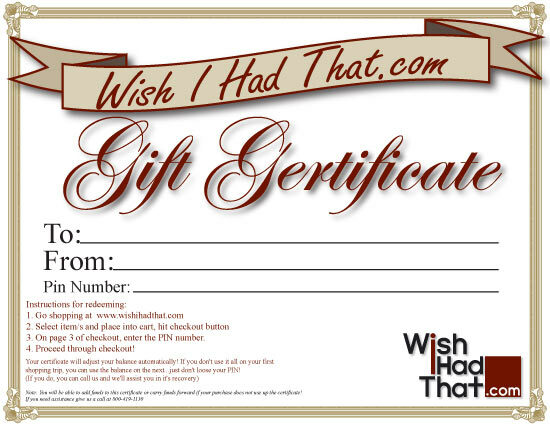 Wish I Had That.com gift certificates are a perfect solution for a casual surprise or a special occasion. Our gift certificates never expire and can be used at anytime. With all the unique and beautiful products that Wish I Had That offers, let your friends or loved ones make their own choice. Gift certificates are available in various amounts and can suit any occasion. After purchasing your gift certificate, you will be sent an e-mail with a PDF file that you can print.The PDF will have the certificate amount and PIN# filled out. Instructions are provided on the gift certificate to let the recipient know how to redeem it. If you have any questions feel free to give us a call at 800-419-1130.